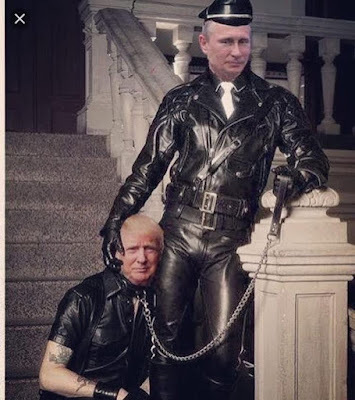 The photo of President Trump with President Putin shows the world that these two fine men share more than just their titles. As you can see, our president and the Russian president have similar fashion sense and get along fabulously. As President Trump has said on more than one occasion, there is nothing wrong with making friends, especially Russian friends. That's a good thing, a very good thing. Believe me. 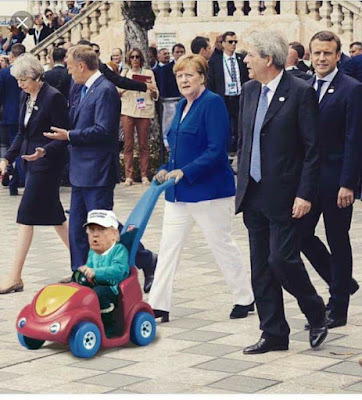 The photo of our president in Stroller One shows how well-liked President Trump is in the world community. World leaders will do anything to help our leader of the free world. Also, I would like to point out that, contrary to you in the the fake news media say, the photo proves that President Trump is thoroughly in support of alternative forms of energy. should be putin peeing on him. Come on now, that top photo is anti-gay kink-shaming. But Merkel photo is on point.